1. Preheat the oven to 180°C/Fan 160°C/Gas 4. 2. Sieve the flour into a mixing bowl. Add the oatlets. Add the butter and thyme and rub into the flour for form breadcrumbs. Stir in the egg yolk and sufficient cold water to mix and form a dough. 3. Wrap the dough in cling film and allow to rest in the fridge for about 30 minutes. 4. Roll out the pastry on a floured surface and using a large scone cutter cut discs to line the greased mini tins with pastry. Place a circle of baking paper over the pastry and fill with baking beans. 5. Transfer to the oven and bake blind for about 8 minutes. 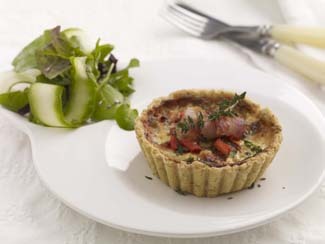 Remove the beans and paper; return the tartlets to the oven for a further 3 – 4 minutes. Keep an eye on them. 6. For the filling, place all the ingredients into a large bowl and mix gently. Carefully, pour the filling into the pastry case and sprinkle the remaining Gruyere cheese on top. 7. Bake the tartlets for 10 - 12 minutes, or until the filling is set. 8. Serve warm or cold with a green salad. Catherine’s Tip: Omit the pancetta and add spinach for a delicious vegetarian option.